Welcome to Rejuvenation Dental, where Dr. Brent Call and his inspirational team of professionals provide dentistry that changes lives. Rejuvenation Dental is a place for aesthetic, implant and general dentistry for all ages. Most dental treatments, including routine dental cleanings and treatment, esthetic rehabilitation of worn and broken teeth, dental implants, the popular 'teeth in a day' procedures, and sedation dentistry can be found here at Rejuvenation Dental. Dr. 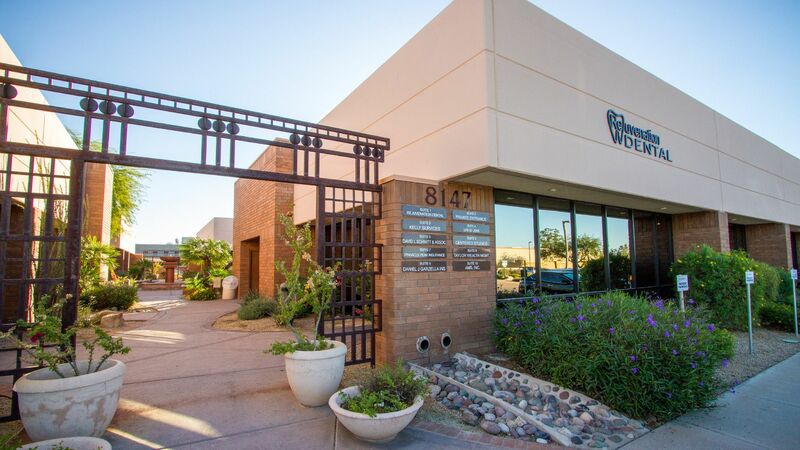 Call and his staff offer a wealth of knowledge and experience in providing some of the best dental care in Arizona. 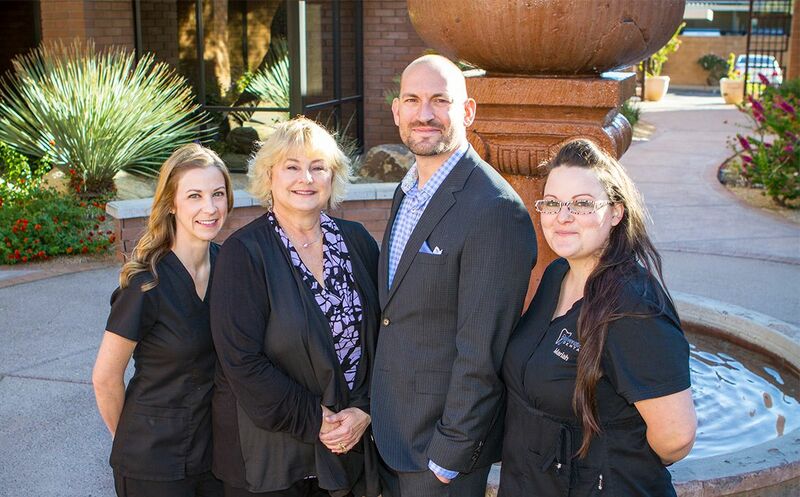 At Rejuvenation Dental, we believe in providing patient appropriate Scottsdale dental care. We understand the uniqueness of your lifestyle and expectations in regards to your dental health. Dr. Call and the staff will personally get to know you in order to create optimal treatment options that will fit with your lifestyle, needs, and desires. We are committed to educating you about your dental health and allowing you to make informed decisions about your dental care. There is no "one size fits all" Scottsdale dentistry at Rejuvenation Dental in Scottsdale. At Rejuvenation Dental, our goal is to maintain and continue to improve the quality of our patients dental health throughout their lifetime. Through quality, comprehensive, patient driven dental care we can provide dentistry that changes lives. For our patients with healthy teeth and smiles, we want to help you maintain that smile for life. For our patients with worn, broken, and/or painful teeth, we want to help Rejuvenate your smile and improve your quality of life. For our patients with missing teeth, we want to help you regain your confidence and function by offering replacement, prosthetic and implant options personally suited to your lifestyle. "Rejuvenation Dental and Dr. Call have been excellent when it comes to our community. They take tremendous care of each and every person that we send their way from our assisted living facilities in Phoenix. Many thanks to Dr. Call and his staff." "We were in the middle of traveling and our son had two baby teeth that refused to come out and were giving him trouble since the adult teeth had come in. We went in for a consult and Dr. Call was able to pull them out in the same appointment. He was very friendly and had a great bedside manner. The office was clean and the staff was friendly." "I broke my tooth and it was over the holidays and Dr Call came in after hours to take it out and put in an implant. I am super scared of the dentist and he was great. He is very gentle and I didn't feel a thing. I am so happy to have found such a good caring honest dentist." "Went last night for routine cleaning. I am always cautious of new dentists as they want to sell you the night guard -you need this and that.....he examined my teeth after cleaning...took the time to tell me about his new venture and asked all about my concerns even though I was the last patient of the day. Very satisfied!!" "If you need dental care,THIS IS THE PLACE TO BE. Dr. Call is the star and has a fantastic staff. Everyone was so competent and gave me a real reason to smile again. Never fear the dentist again. You'll want to go back just to say hello to Dr., Carol, Mariah and Jillian. You just can't beat this team." "The staff are so friendly and make you feel very comfortable. I went in for a cleaning and had the best dentist experience I've ever had. Also had to go back to get a chipped tooth repaired and I was in and out. Would definitely recommend if you are looking for a new dentist and aren't sure where to go." "Dr Call and Tina both went above and beyond and made sure my comfort was token care of. I was very nervous going into the appointment but they both went over everything and letting me know of the options. The staff there are great and will welcome you. He comes very recommended!" "Very friendly and helpful staff that were excellent to work with and go above and beyond to make sure that you are actually treated like a human being! I would highly recommend Rejuvenation Dental to everyone! Never knew the dentist could be a positive experience until now!" "Dr. Call and his staff are very helpful and are always interested in providing the best procedure for the patient. Services are top notch." "Dr. Call and the staff were not only quick and ​​​​​​​efficient, but most importantly they were honest and kind. They let me know all of my options and explained the procedures and why they were necessary. I highly recommend Rejuvenation Dental to people who want a good visit to the dentist."